For those of you living outside of Japan, I wish there was some way for you to get your hands on these AMAZING polishes. If you, or someone you know, are ever in Japan, you have to buy a few Addiction polishes! 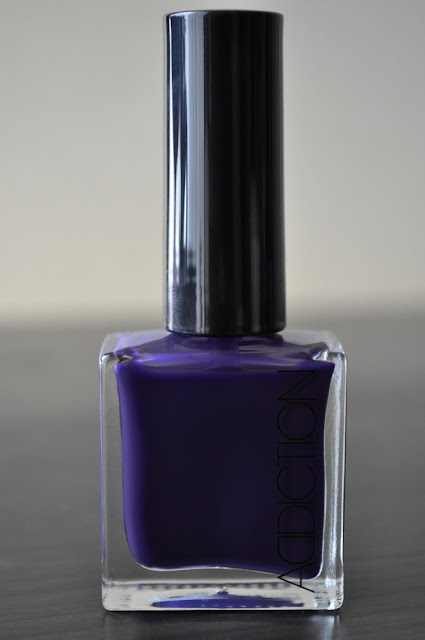 Purple rain is a murky, deep bluish-purple with a blinding gloss finish that is synonymous with Addiction polishes. The gel formula does run thin, so the polish does require 4-5 coats for opacity. I love the color, glossy finish, and the 5-6 day wear time, so much so, that I don't mind putting in a little extra elbow grease for Purple Rain. I'm not even wearing a top coat in the photo. The glossy finish is unprecedented! I wish I could mail these out to you, but custom is very strict in regards to mailing out nail polishes...boo! Wow, it looks so glossy! I've never actually tried Japanese nail polish. How would you compare this to say, some Western brands like OPI/Essie? Thanks! Addiction polishes are probably the glossiest polishes ever! They blow OPI and Essie out of the water. but with that said if you visit the states please send me a ADDICTION nail polish to me... they are too juicy to pass!!!! I am sooo jealous!!!!! I cannot wait to pick up these polishes when I come to Japan - countdown!